When Tom Brady helped the New England Patriots win the Super Bowl in January, it helped cement in the eyes of many his status as the GOAT — the Greatest Of All Time — and much of that comes from his sustained level of dominance he exhibited throughout his 30s. Super Bowl LI was the fifth Super Bowl win for Brady. It was also the final game of his 30s as he will turn 40 on August 3. But while most quarterbacks have been long retired by the time they turn 40, Brady continued to dominate the sport throughout his 30s in a way never seen before. 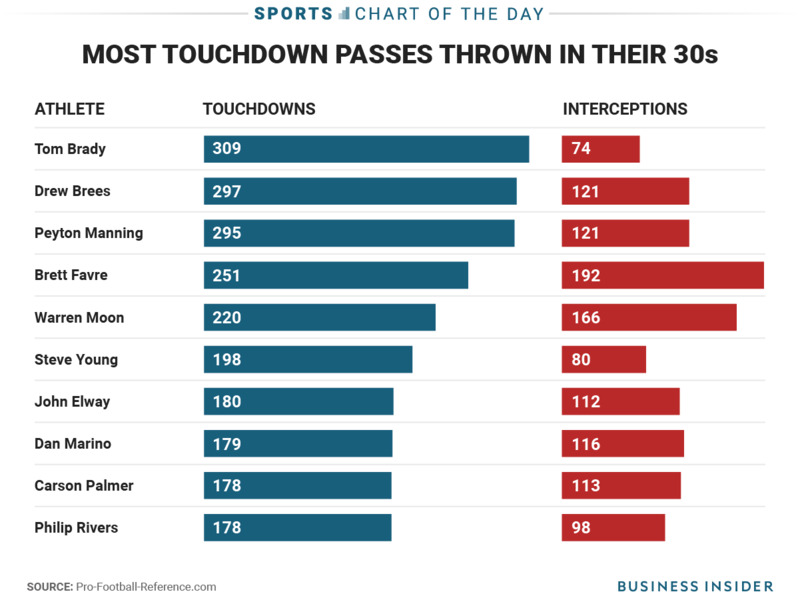 Over the past decade, Brady threw 309 touchdown passes, the only player to ever throw 300 touchdowns in his 30s and one of only five quarterbacks to even throw 200 touchdown passes in his 30s. 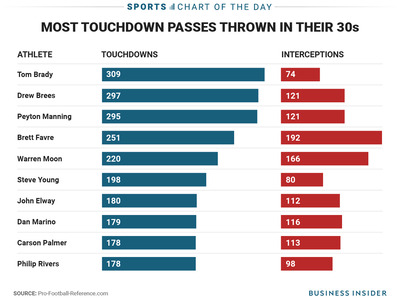 But maybe even more impressive is how few interceptions he threw in his 30s compared to others. The 74 interceptions thrown by Brady in his 30s is at least 47 fewer than anybody else who threw 200 touchdowns in their 30s and the fewest thrown by anybody who had at least 178 touchdowns in their 30s.